Explore Noritz NRC series of tankless and condensing water heaters for high-efficient and ultra-performing water heating in residential applications that saves money and reduces the gas emission. Specially designed NRC series is one of the most advanced groups from the Noritz manufacturer, offering great features and innovative water heating technology. If you are looking to replace an old and bulky gas or electric tank water heater with the more efficient unit, would like to get more of the floor space, and at the same time have an unlimited amount of hot, fresh and clean water, check out Noritz tankless water heaters from the NRC series. As most of the tankless models, the NRC series provides on-demand and an endless supply of hot water, but the greatest benefit is the condensing technology. It uses the secondary heat exchanger where cold water is preheated before it reaches the primary heat exchanger, resulting in increased efficiency of over 93% and considerable reduction in NOx emission, making the energy bill lower. Noritz NRC series comes with the four tankless and condensing model sizes, made for indoor (DV models) and outdoor use, all utilizing the smart technology for the accurate and stable temperature and error diagnostics, but with the different capacities and sizes. All the models, due to the high energy factor are Energy Star compliant. Noritz NRC111 model is the largest and most powerful unit in this category that can achieve up to 199,900 BTU and water flow rate of 11.1 GPM, so it is recommended for homes with up to 4 baths, heating water to the maximum temperature of 140 F while providing the energy factor of up to 94. NRC111 is able to modulate the power from 199,900 BTU to its minimum of 16,000 BTU, outperforming many competitors due to better and accurate control of the hot water temperature, while working with the lower water flow rates. The NRC98 model comes with the maximum gas input of 180,000 BTU and is recommended for homes with up to 3.5 baths, while the NRC711 has a lower power of 157,000 BTU so it can be used in homes with up to 2.5 baths. Noritz NRC661 model is the smallest unit that comes with the single gas burner and only 120,000 BTU of power and 6.1 GPM water flow and is used for the combined potable water and space heating in homes with the maximum of 2 people. NRC711 and NRC661, both indoor and outdoor, also come with the small, integrated digital display found on the front panel of the unit. Noritz NRC water heaters with the condensing technology utilize a dual heat exchanger that is consisted of the copper and stainless steel heat exchanger. Durable stainless steel element is added to capture the residual exhaust heat and exchanges it with incoming water increasing the temperature of the water before it enters the primary heat exchanger, resulting in higher efficiency than non-condensing models. The temperature of the exhaust gases is about 400 F (204 C), and once it transfers the heat to the incoming water, the temperature of the exiting flue gases drops to 120 F (49 C). As the flue gases have lots of moisture, condensation occurs; the drain pipe should be installed for water discharge. The temperature of the outgoing flue gases is lower, so instead of using stainless steel pipes you are allowed to use much cheaper PVC for venting. With the built-in PVC adapter, it is very easy to install a venting system, making the installation cheaper and faster. The outdoor models such as Noritz NRC661-OD are designed for installation outside and do not require the venting system. As an accessory, you can buy a recess box, a cover that protects the unit from the harsh weather conditions. As opposed to the above outdoor model, indoor models, such as Noritz NRC661-DV is direct vent unit that must be installed indoor only, with the vent system installed vertically or horizontally. The most used pipe types are PVC or CPVC. All the direct vent (DV) models can be converted to a non-direct model (SV) but with the correct conversion kit. Both indoor and outdoor models from NRC771 and NRC661 utilize a small, digital display integrated at the bottom of the unit, and it provides some useful info to the users; such as the status, current hot water temperature, water flow, and error codes in a case of the unit failure. Larger models, NRC111 and NRC98, do not have such displays but include a remote thermostat instead, while for others is optional. As seen from the above features, the maximum water flow rate of 11.1 GPM is enough for up to 4.5 bath homes. Now, what to do if more hot water is needed, and the demand for hot water is higher? In that case, buy the Nortiz Quick-Connect cord as it is provided as an optional accessory, so two identical units can be linked together and deliver twice the hot water capacity. Noritz NRC models are factory set to 120 F, but you still have several options to set the output temperature between 100 F and 140 F. You can also set the temperature of the water that comes out of the hot tap using a remote controller. Small and compact size, saves the floor space. Automatic ignition device, no pilot. Over 93% efficiency level with a new condensing technology. Dual flame burner for minimal hot water temperature fluctuation. Dual heat exchanger, one made of copper, second from stainless steel. Modulating gas valve for automatically burner output adjustment. Turbo Flow system for high demand applications provides 11.1 GPM. Quick Connect cable allows connection of two identical units to get more hot water, easily controlled with a remote control. Self-diagnostic onboard computer system, great for troubleshooting and repairs. Low temperature of the exhaust gases makes the vent pipe cool to the touch. Long warranty of 12 years on the heat exchanger in residential applications. Thermal fuse provides automatic protection from overheating. Freeze-prevention heater works automatically if the power is provided. Automatic air regulator monitors an internal temperature. Built-in neutralizing system for condensation. Isolation valves with a pressure relief valve - allows easy flushing and full diagnostic testing. Multi-system controller is required when connecting over 3 units. ScaleShield is Noritz brand water softener protects; from lime and mineral build up. When installing inside, sufficient air supply should be provided as it is using the inside air for combustion and one flue pipe for products of combustion extraction. It is important to drain the condensate securely without blocking the drainage, especially if installing it inside. The significant amount of the condensate can be extracted (around 2 gallons per hour), and what is left from the moisture in the flue it turns into the white steam at the vent discharge terminal. Once installed outside, Noritz outdoor model can be exposed to lower freezing temperatures. That is why you should not remove the power plug from the electrical outlet. The freezing device protects the unit only, not plumbing. For the extremely cold weather and if the unit is not used for a while, the best solution is to drain the whole unit. For the vertical roof vent penetration, the recommendation is to use a rain cap at the end of the vent. A bird screen is an option for both horizontal and vertical vents, a solution that keeps birds from entering the vent pipe. All the models can be used for residential, commercial and in manufactured home applications, but not in RVs or boats. 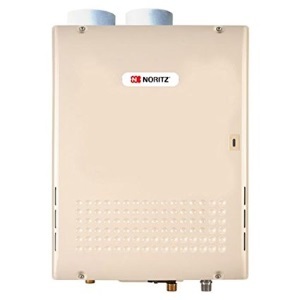 Tankless water heaters from Noritz NRC series offer many reasons to the homeowners to switch from the traditional tank-type and buy a model that uses the latest innovative technology. It is not only the size of the unit or on-demand water heating. It is also saving money, a reduction in environmental pollution, efficient operation, high performance, energy conservation, flexibility in installation, enhanced comfort and much more. Again, NRC661 and NRC771 are recommended for smaller homes, NRC98 for mid-size and NRC111 for large homes and families.